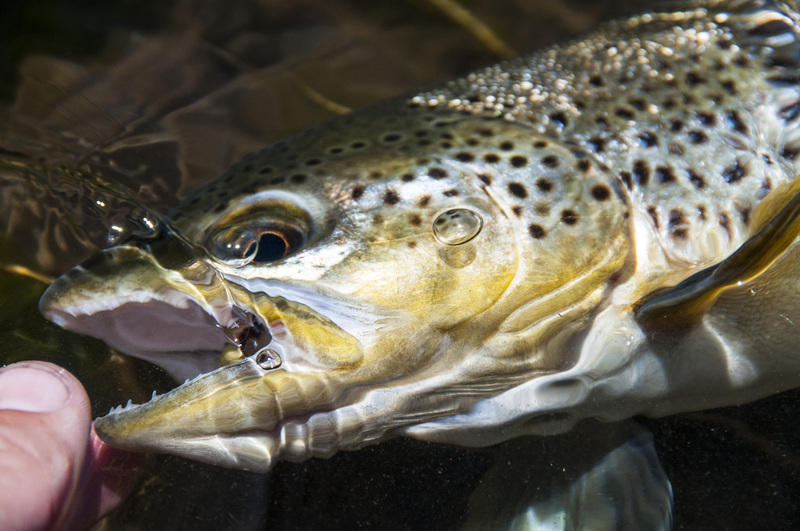 And so we woke early and were on the trail by 5:30am – early for trout in my opinion but the weather had gotten quite warm and we all left that the sluggish midday heat would put a dampener on both us and the fishing. 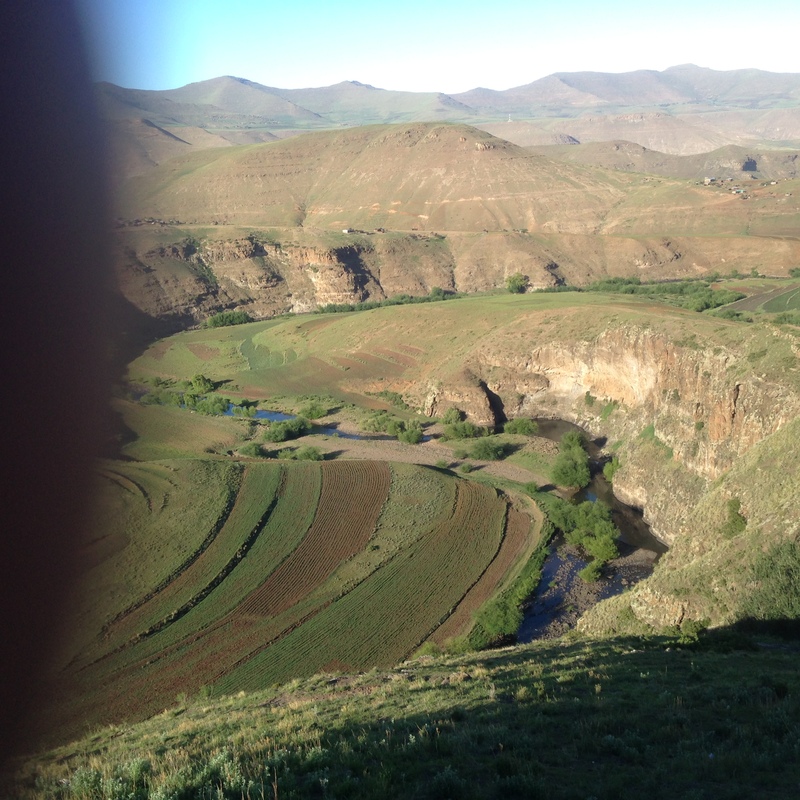 We were heading down to fish the bigger water in a gorge several kilometers below camp. Rex was pointing out water that he had fished yesterday – beautiful pools with sweeping weed that gave one the feeling of looking own on an English chalk stream. Big, deep, slow moving water. It holds its share of lunkers I’m sure, but was not what I was after. Ryan headed down to fish a series of pools below some steep cliffs and I did the same further downstream. Rex kept going, his mind on the depths of the gorge. I very quickly become disillusioned by the water. This was not how I wanted to spend my last days; drifting heavy nymphs through deep murky pools. Yes, I’m 100% sure there are some SERIOUS fish in the depths but short of breaking out the full sink line I wasn’t going to get close. 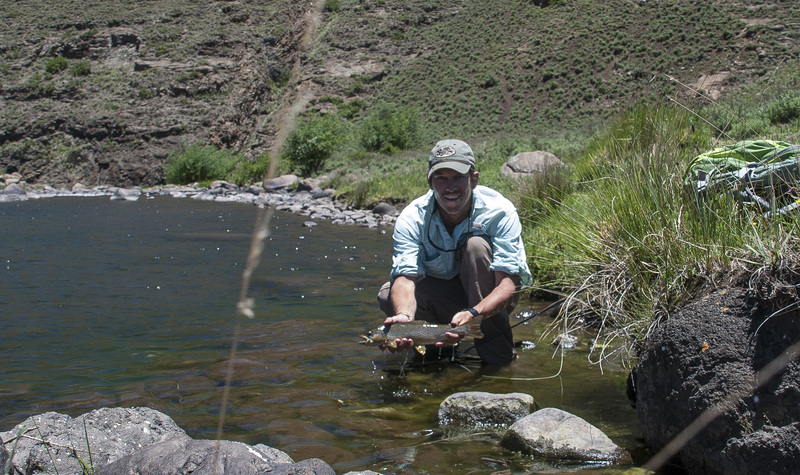 And there wasn’t enough current to swing a sinker either – I really learnt to enjoy swinging a fly during last year’s Patagonian adventures. So made a call: Retrace my morning steps, stop by camp, pick some food, then head upstream and find some clearer water that would tickle my fancy. I was starting to feel the brownie gremlin again – I wanted a decent fish or two. So I found Ryan and explained my plan and that said I’d see them that evening. The walk to camp seemed longer than anticipated and I had started a fair sweat by the time I got to camp. I couldn’t find the biltong or the coffee, so cursing I set off, a couple of Rush Bars would be have to do for lunch. I walked up stream for an hour – hard, determined and undistracted. I wanted to get higher up before I started watching and fishing. Once my timer signalled the end of my walk, I strung up my rod and sat above a deep pool. I was very pleased that the visibility was far better than further down – things were looking up. I saw a small rainbow rise in the middle and immediately moved to the next pool. Same story here so on to the third. 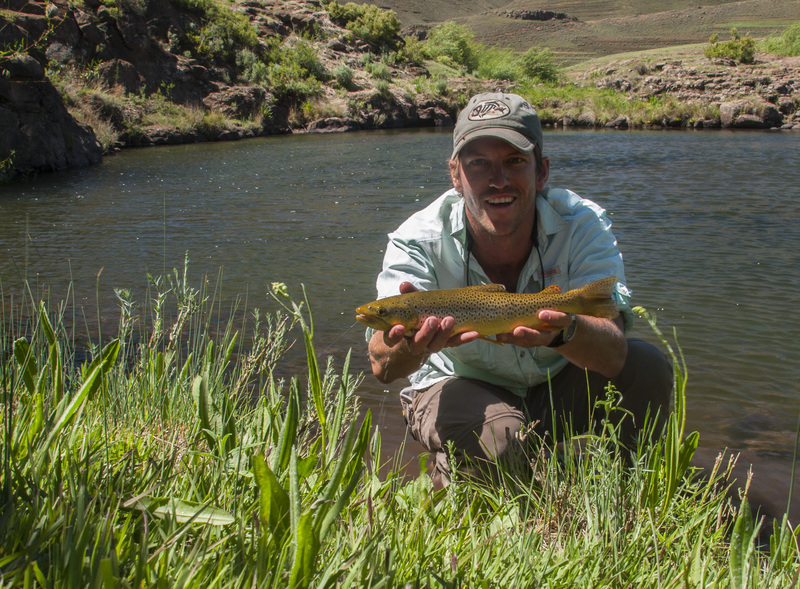 We are convinced that the pools that hold small rainbows rarely hold big browns. 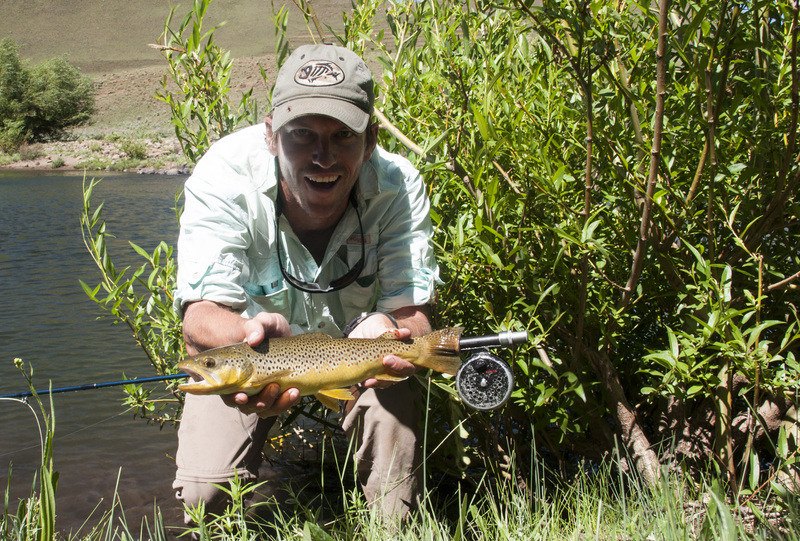 It appears that big browns rule with an iron fist and often the pools that appear desolate hold the trophies. And so it was on the fourth pool. No movement at all. I watched and waited. Eventually sometime down in the depths could my attention. Not much to go on but I had a position. I snuck down to the pool edge and sent out a big hopper imitation. Almost immediately a fish appeared wraith-like out of the murk and inspected my fly. Denied. Down it went. Changed fly to my best RAB, same treatment. At least I was raising him. Caddis, didn’t even bother coming up. The initial hand shake had calmed slightly and changing flies seemed quicker. A smaller hopper, inspection, denial. Then I decided it was time for Yuri’s fly. I had only tied two of these horrid looking flies (no offense Yuri!) but figured it was now or never. Expecting the same treatment I dropped the Gangnam Style in the same spot as the last four flies. Out came the brown except this time there was no early turn. Fish on! I heard the herdsboy shouting at me for the first time when I tailed the beautiful fish. But I could ignore, like my Gremlin, quickly felt my trip become complete. A couple of shots of the fish in the water and, to disgust of my young herdsman, I watched it swim away. I was now relaxed, I felt that my casts were crisper, presentations softer and the gremlin was hushed. The next pool produced another beautiful rising fish although the tippet popped on the second backflip. I felt a little disappointed but no worries, two pinned in two pools – . It was 11:30. The next couple of pools produced nought. And then another, this time on a hopper. 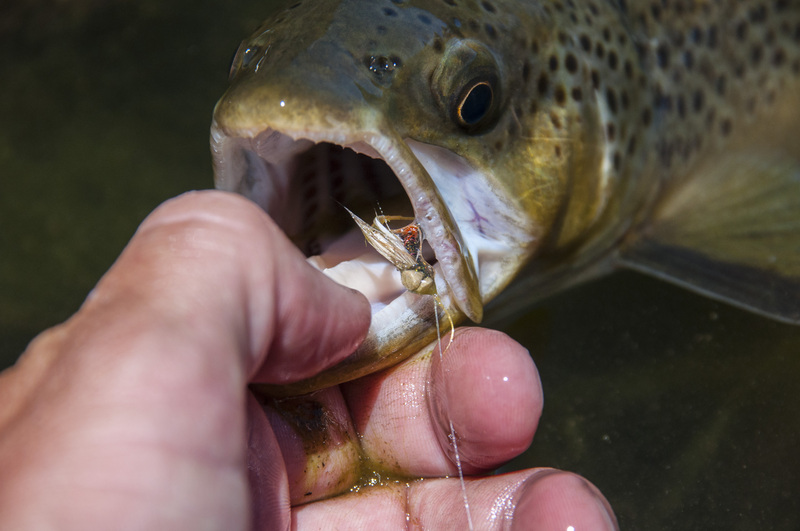 What pleasure watching that fish float up under my fly, inspect and then inhale. 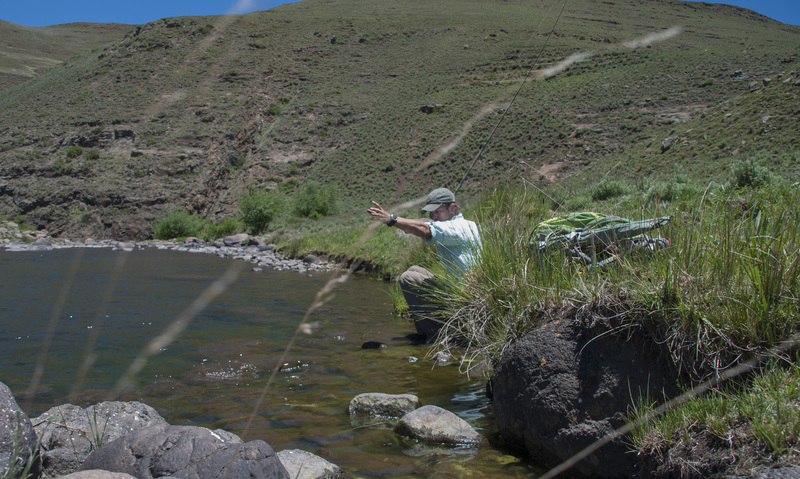 The moments that follow are special and always etched into my mind; the swirl that replaces fly with boil, the rod tip lifting and the left hand strip striking. The same instant the flyline slicing off the water. The heavy weight, unsure of the strange pressure. A shake and then the explosion of fish as it decides it wants out. The rest blurs, but for me the take and hook set are vivid. As is the release. I continued in this vein for the rest of the day, landing three more and dropping another two, until I came upon sight that made my knees give in. Lying up against a weed bank was beautiful brown, about two pounds, feeding sedately. But below it was a fish almost twice the length. Quandary. Both fish were feeding but the smaller was feeding harder. I watched them for almost an hour. Lazy, slow and never apart. Nothing would separate them. What could I do but cast and hope. And so, I my hopper dropped a foot above the two trout, my breathing stopped as the two fish made a concerted effort to eat my fly. For a split second I thought I had king rat. But it was not to be. Another beautiful brown came to hand. I could have kicked it! I sat and waited for the big one to appear again. It didn’t – it’s big for a reason! What a fish. To know its there, finning away in a pool on a river far from the imagination of most. Bittersweet moments like this make fishing worthwhile. * Apologies for lack of photos on this post. Some days nothing but what you are focussed on makes a difference. I managed a few selfies and close ups. But looking back, I wouldn’t change anything. Ok. Maybe i must start trout fishing.